Remember Iran? Our new ally in the war against terror? In his top-selling book, “Solving 9/11: The Deception That Changed the World”, Christopher Bollyn states that a small gang of high-level Zionist extremists carried out the 9/11 attacks on the US soil. According to the American investigative journalist, this group centers on Shimon Peres, who is currently president of Israel, as well as other Zionist leaders, such as the former prime minister, Ehud Olmert, and the current prime minister, Benjamin Netanyahu. The gang also includes the former minister of defense, Ehud Barak, and other less known members of Israel’s military intelligence establishment. Former Mossad officers, especially people like Arnon Milchan, who have been involved in building Israel’s nuclear weapons arsenal with Shimon Peres, are also included. Supreme Leaders’ senior advisor Ali Akbar Velayati referred to the recent developments in the Middle-East and North Africa, and said the arrogant powers can no more stand against the new world order being shaped by the Islamic Awakening. “The world is witnessing a change and tilt in power equations towards the Muslim world with the rapid growth of developments in West Asia and North Africa and this important event has basically created the new regional order, and the world of arrogance is and will no more be able to confront this new order,” Velayati told FNA on Tuesday. His remarks came after Ayatollah Khamenei said on Thursday that the West lacked the might and awe it enjoyed in the past as its representative, the Zionist regime of Israel, lost the battle against the small population of the Muslims in Gaza. “The current world order cannot continue and a new order is emerging,” Ayatollah Khamenei said in a meeting with members of the Assembly of Experts in Tehran. 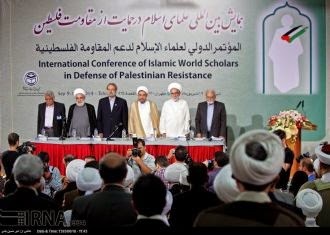 On Monday, Iran hosted an international conference on the Palestinian resistance in Tehran. The conference brought together over 400 religious scholars from across the globe. The conference came after Palestinians bravely resisted the Zionist regime’s 51-day war on Gaza. Addressing the conference, Ali Akbar Velayati, a senior foreign policy advisor to the Supreme Leader, said …that Muslims are duty bound to support the Palestinian resistance and express disgust at the “illegitimate and child-killer Zionist regime”. Now that the Zionist regime’s “illegitimate and dangerous” nature has been exposed to the entire world, Muslims should make efforts in arming the Palestinian resistance “because their ability to defend themselves is the only thing that alleviates the Palestinians’ pain”. But, remember: they don’t like extremist Sunni Islamists (who aren’t shooting at Israel) and we don’t like extremist Sunni Islamists. So besides their rabid daily attacks on Western civilization and explicit support for terror groups, we really have a lot in common.